I live in a semi-desert. You wouldn’t know it from all the green lawns and sprinklers and weeping willows around, but it is pretty dry here. We rely on snowmelt from the mountains being stored in reservoirs, and as more people move here, we want to conserve the water we get. 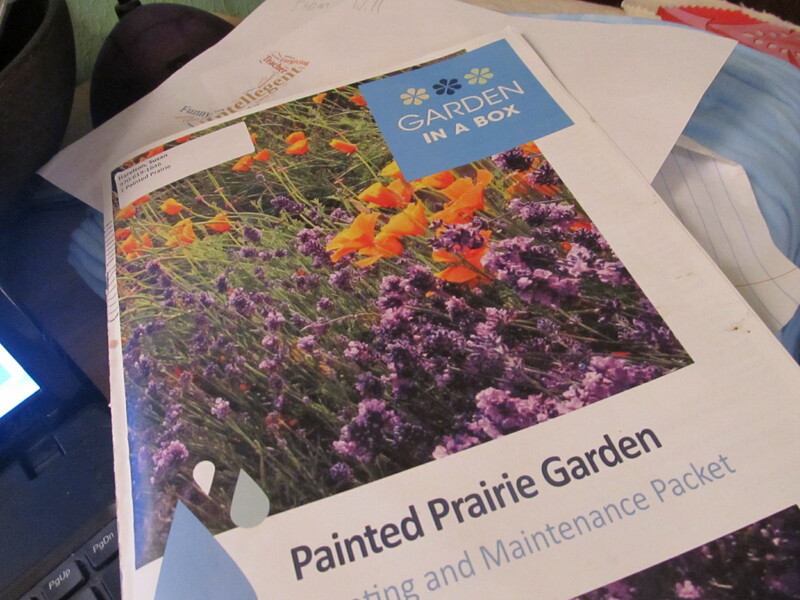 My city water department, in conjunction with Boulder’s Center for ReSource Conservation (yeah, I don’t know what the deal is with the capitol s… it’s annoying) is selling gardens in a box. They have for several years. The Center has hired designers to put together some preplanned gardens with drought tolerant plants. People who live all over the front range of Colorado can participate, and several city utilities give rebates. Depending on where you live, your local utility may offer something similar. Google it. I have pooh-poohed the idea of a pre-planned garden in the past- I felt like I could design my own gardens, thank you very much. Plug in some iris, srpinkle on some larkspur- BAM! its a garden! This year I had a lot of space to fill, though. We got rid of our swing set, and so we have about 400 square feet of weedy grass to convert. I plan to put in a couple of fruit trees, but I want flowers around them. Grass also typically takes much more water to look good than the xeric flowers and shrubs that I like. are happy with natural rainfall) and also because it is a boatload of plants for not very much money. Remember, I’m frugal. How much? That’s a very crass question…oh, wait, I brought it up. Well, with a rebate from the city, it was $110 for 29 plants in 4 inch pots, which covers 100 square feet. My typical way of planting new gardens is to get my mother in law to give me divisions from her garden, and divide stuff that I already have, which is essentially free. However, the garden I chose has plants that are new to me, and my wonderful mother-in-law. Maybe someday I’ll be able to divide these, and give back to her. Someday. If I were getting these plants at a nursery, it would cost more, and I would be unlikely to choose these particular plants. I’m a person who reads about compost for fun, I read seed catalogs and garden books and even listen to the garden guy on the radio. I think about plants a lot, but I hadn’t heard of most of these before.